It was a dark and dreary afternoon last Sunday, Oct. 8 as a crowd gathered at Maple Grove Cemetery. 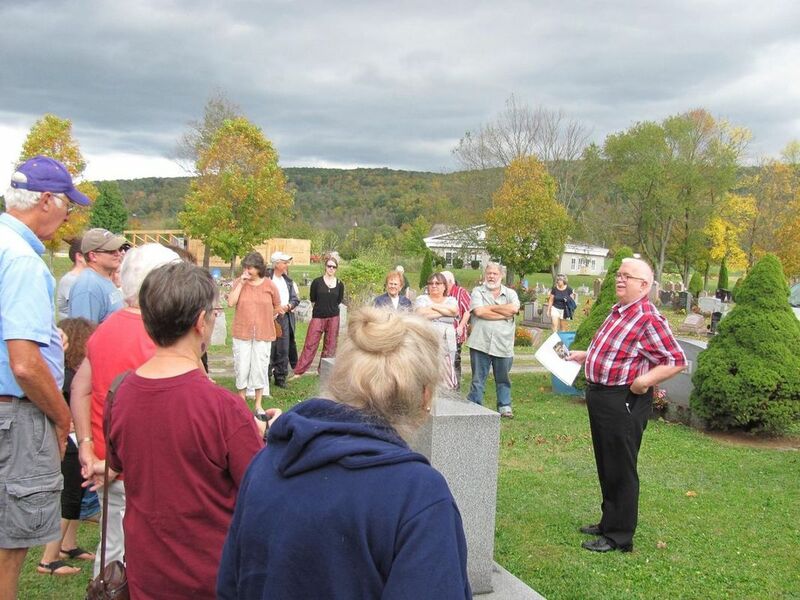 The event: a not-yet-Halloween cemetery tour hosted by the Candor Historical Society and led by local psychic, Phil Jordan. “Be careful,” Jordan warned before leading the group to the first granite headstone. “The ground is uneven and I want everyone to stay on this side of the grass today.” A chill breeze wafted by, rattling dying leaves. Vernon “Bucky” Harris has a special place in Jordan’s heart. He was a big guy, tough – and yet, when Jordan was faced with dropping out of college because he couldn’t afford a tuition payment, Bucky Harris came through with a $75 loan. “He made sure I knew it was a loan, and that I would have to repay it,” Jordan said. He went on to share a tale about how Bucky and Tom Brewer worked the garbage route together. That was back in the day when they just used an old truck, Jordan explained. It cost a quarter to have your garbage hauled away. When kids would bother them, the guys would pick up the kid by the seat of his pants and swing him over the truck. “They threatened to toss us in with the garbage and haul us away,” Jordan said. Brewer eventually went to college and ended up teaching agricultural economics at Penn State. Jordan had tales about Roger Townsend, the town constable, as well – in particular, a yearly Halloween prank. Certain youngsters would climb into St. Paul’s Episcopal Church and hide until midnight, when they’d ring the bell. Then, the kids would scamper out the back door and run across the way to safety. “But this time Roger was there,” Jordan said. “So we hid in the pipe organ. We pulled the door shut; he was trying to pull it open.” The standoff was resolved when Townsend ordered the kids to meet him at 7 a.m. the following morning. Stopping between the Craig and Strong family plots, Jordan began telling stories about numerous members of the family. In particular he remembered Pieny (Lena Pauline) who would pick up the phone when it rang – this was back in the day when everyone was on party lines. She’d sometimes fall asleep listening to the local gossip. Irvin Schoonover was another veteran, thought lost in the war. He went Missing in Action and was eventually declared dead. “Three years later a bus pulls up in front of the Millstream tavern and in walks Irvin. People thought they were seeing a ghost!” These are but a few of the tales told during the walk. Jordan is already making plans for another cemetery tour next fall, when he can dish more dirt on dearly departed friends and family. Click here to see of video of Phil's comments.